Even non-trader people know that Bitcoin or the Cryptocurrency world is getting huge by the second! But how to does a value of Crypto rise? Simple, if a currency is being widely used the value skyrockets, look at what happened to Bitcoin. Now, what better way to increase the value of a coin if it is being traded. That is why new altcoins are trying their best to get into the trading game due to this fact. They want their coin to get more audience so that it will increase in value. With this being said, there is a huge number of exchange website/trading platforms today due to the surge of cryptocurrency trading. With that being said, there are only a handful of websites that specialize in the trading of cryptocurrencies. Today, we will be looking into one of those websites; the website is called Deribit.com. Without further delay, let’s look into what they have! The website name “Deribit” comes from the words Derivatives and Bitcoin, take the first three letters of both words and you’ve got Deribit. The website has been operating since 2016 and is being run in their physical office located in Amsterdam. The CEO and original founder of the company is an experienced exchange options trader since the late 90’s and is also a Bitcoin enthusiast. Knowing what cryptocurrency can do with the current exchange market, he ventured into creating a website dedicated to crypto trading, thus the Deribit idea was born. As an online trader, it is a need to know if the website you are interested trading in does have trading limits. Most of these limits imposed have something to do with how much you are able to trade with a regular unverified account versus an account that has gone through different verification processed to acquire a higher tier account. In other words, the higher the tier of the account, the larger the volume of trade can be done. Question is do they have something like that here at Deribit.com? The answer to that question is, NO. Here at Deribit.com, you do not need to go through any verification level since their mode of transaction is purely made with Bitcoin, of course, anonymity cannot be preserved if personal information is passed through the internet. Since there are no verification levels, all you need to do is create an account and start trading! How do you create an account? 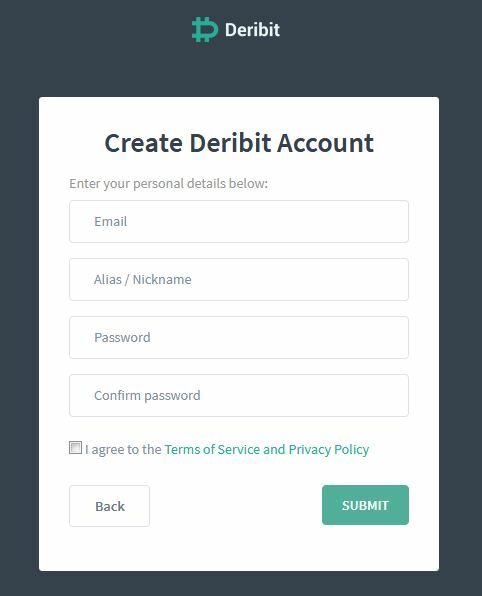 An account is easily created by of course going to their website Deribit.com and click on create an account. This will redirect you to a different page and you will be asked to provide an email, alias/nickname, and password for your new account. Click on the accept terms and conditions and click submit. You will then get a prompt saying that you have created an account successfully and that you need to click the confirmation link sent to the provided email address. Please be advised that you get a couple of verification emails after clicking on the link; this is not spam. Here in Deribit.com, there’s such a thing as insurance fund where positions that are most likely be bankrupt have a safety net of 25 Bitcoins. This means that worst comes to worst, they have insurance to keep them afloat since they have the 25 BTC ready in place. You can read more about this awesome feature and look into the instances that they went below 25 BTC here. Aside from this awesome “umbrella” like a feature that shields them from possible bankruptcy, they also offer Two-Factor Authentication which is always nice to have. Please bear in mind that not all trading/exchange platforms today have the ability to add 2FA features. To access this feature, you just need to log into your account and go to the left-hand side panel of your account and click on “Security” and click on the “Enable two-factor authentication” tab. They also offer an affiliate program which you can earn from if you’re into that kind of stuff. To turn on your affiliate program, send an application email to affiliate@deribit.com. We were looking around for educational materials that can help out a fresh trader in trading, but sadly we only found two videos under their “Help” tab which, of course, it helped out in explaining how futures work. This can be really great if you are looking for general information on how it all works out making it a great feature that is installed on the website. If futures are new to you, please watch the video below as it contains educational material that will be an advantage as you grow within the trading world. Since all transactions done on this website is made purely with Bitcoin, the deposit and withdrawal method is not as complicated compared to other websites out there today. To deposit, you just need to head on to your account dashboard, click on the deposit tab found on the left-hand side panel and the deposit tab will open. In the deposit tab as seen in the screenshot provided above; there’s a unique address provided. To maintain a high level of security per transaction, we advise refreshing the address once a day just to make sure that it will not be reused. 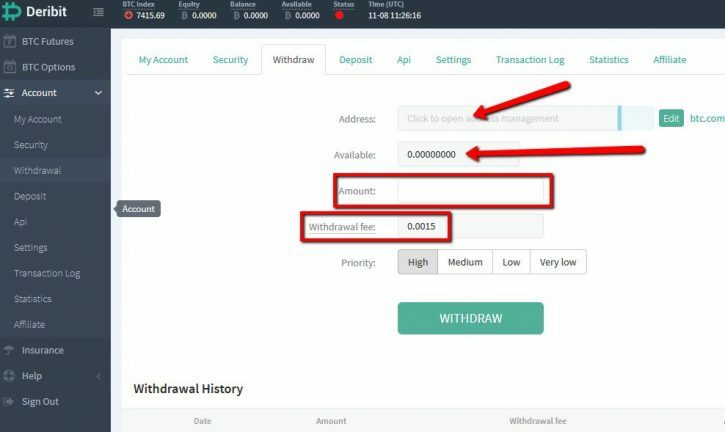 Now when it comes to withdrawals, all you need to do is click on the withdrawal tab and you will be redirected to the withdrawal page wherein you are able to provide your personal Bitcoin wallet address, see the available BTC balance the account, the amount that you want to withdraw, and the withdrawal fee. Please be advised that the withdrawal fee has different priorities, with High being the fastest to very low or normal transfer process. Fees range between 0.0002 up to 0.0015 per withdrawal transaction. They keep most of their Bitcoin in their Cold Wallet storage to keep everything safe and away from prying hands. Now with the interesting part; fees! I’m sure that you are itching to know the fees for trading here at Deribit.com since there are a lot of trading platforms today that offer no trading fees. Sadly, Deribit isn’t one of those websites that offer such convenience. Traders that are active in the online trading scene, the terms “Maker” and “Taker” should not be alien language to you. Futures – The contract size is $10 and the maker fee is -0.02% (Rebate) and the Taker Fee is 0.05%. Options – Contract size per 1 BTC: Maker Fee is 0.000 BTC (0% of contract size) and the Taker Fee is 0.0004 BTC (0.04% of contract size). They also noted that fees can never be higher than 20% of the option being traded. For example, if an option being traded is at 0.05 BTC, the fee should not exceed 0.01 BTC. To read more about their fees, please click here. Now we’ve come to the best part of the review, trading! Since Deribit.com doesn’t have a virtual/test/dummy account, we are unable to try out a dummy trade. No need to worry since we will still be looking into what they have for us in general. The screenshot provided above is a picture of the BTC Futures tab wherein you are able to buy Future contracts. As mentioned earlier in this review, contracts under the futures tab come in $10 each. You are able to choose between contracts or straight BTC payments. In addition, under the BTC Futures tab, you are able to choose how many contracts you are able to purchase from the minimum of 1 contract to an unlimited amount depending on how much you are willing to go with. In addition, the price of the contracts can also be changed depending on the current BTC rate. Current minimum at the time of this review was written is at $6860.23 and the maximum is at $7212.56. Once everything has been tweaked, click BUY or SELL contract and this will appear in the order book right beside it. If the amount of the contract is matched, the order will be filled out instantly. If the order cannot be fulfilled, this will be added to the Order Book queue. Moving on to the next tab under the Futures would be the Options. 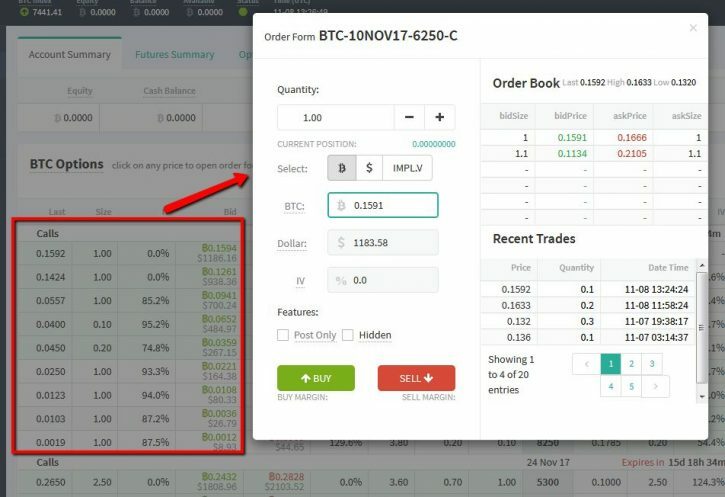 It’s quite simple, if you see something interesting listed in the BTC Options tab, click on that and an order box will pop up for you to look into. The order book for the options order contains all the needed information to complete the purchase. Price can be adjusted from dollars to BTC (but please be advised that transactions are all based in BTC and dollars will be converted to the current BTC value). The minimum quantity that can be purchased cannot be less than 0.1 BTC per transaction. Additional information: Accounts have an initial trade margin requirement of 10% and all accounts are required to maintain a margin of 3% of a trader’s position to ensure everything will run smoothly. We know that everybody has their own personal level of understanding. But when it comes to online trading/exchange platforms, it is always good to consider new traders since they are the ones with the lesser knowledge of the field. Trading/exchange companies should consider (especially the new ones) that they need to have a website that is not optimized for trading but easy to understand as well. One thing that struck us was the fact that this website is not designed for someone new to the online trading world. Everything was just a clutter of numbers! Compared to some websites where they do not bombard you with information, Deribit.com is surely a far cry from that. What we think they should do is maximize their website function-ability and redesign it to be a better one, something that is more in line with what most of the trading platforms have today –having simplicity. And without proper integration (trading guide) of the user to their interface, everything is just confusing if you do not spend a good amount of time looking around the website. For this, we give them 3/10 for their website interface. Most of our reviews we have always stressed out how important it is to have a valuable customer service support team when it comes to websites that handle people’s money. May it be an online casino or trading/exchange platform, everything should be streamlined when it comes to customer care. This is because when money is being handled, this should be handled with precision and when an error occurs, this should be handled with professionalism and fast resolution. Of course, how do you want to be handled when it comes to issues with your account that contains your hard earned money? Here at Deribit.com, they have a live chat box which can be accessed by logging into your account and clicking on the little box located on the lower right-hand side of the account page. The only downside of this live chat box is that this is a public live chat feature, which means that if you ask help from the developers here, you would not get attention right away. It would have been better if they had a live chat support system so that registered customers can contact them right away if there are issues with their accounts. Another thing that we noticed is that they do not have any phone support in case someone wants to call them. We know that we are phone people which made us really upset since they didn’t have any phone numbers listed. It is better to talk to someone through the phone as this solves issues faster and miscommunications can be avoided. If you guys have their direct phone contact, please let us know in the comments section below. We’ve gone through every important part of this website, now it’s time to look into what people are saying about this website. We need to know about the negative things that people have experienced with this website so that we are able to properly assess the issues and decide whether to take the risks or not. Of course, we went to Google and typed in “Deribit Scams” and found out nothing about the website. No payment issues, withdrawal issues and whatnot about them. This is both scary and refreshing at the same time. The only reason that we can think of is the fact that this website is new and that there are no issues with trading with them, yet. Is that a good thing? Of course it is! This website is fairly young compared to other trading websites today; making this review more of a general view of what this website has to offer. What we’ve noticed about Deribit.com is that they offer a good set of features that can be used to your advantage when trading with them. They also do not have account levels when it comes to trading through their website! Since all of their transactions are done with Bitcoin, the level of anonymity is higher compared to an average trading/exchange website where they accept different bank payment methods. One important thing to take note would be their insurance feature since not all trading websites have this. It is there to make sure that all trades are with a safety net (as long as you keep it within 25 BTC) making traders feel secure knowing that the website has got their backs. 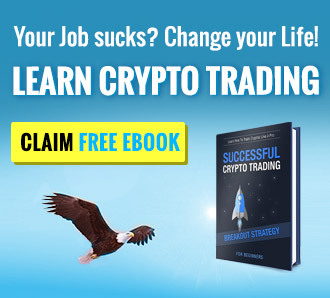 In general, this website is good but due to the way it is designed (non-user friendly) makes it harder for new traders to just come right in and start trading within the first minute.